Ignoring the typo, I had no idea my youngest knew how to play poker! This random question came out of nowhere, and provided me with a much needed LOL, ‘choke on my water as I’m rushing to a meeting’ moment that I desperately needed today. I’m leaving at the end of the week for a family trip, so I’ve already crammed five days worth of meetings into three days. Mondays are always hectic, and my jam packed day was rudely interrupted by an unscheduled visit to the eye doctor mid-morning. What I thought was a scratched cornea turned out to be a painful eye infection. My necessary exit from work included the eye doctor followed by Walgreen’s for medicated drops. I returned to work a few hours later crabby, in pain and feeling even more behind. 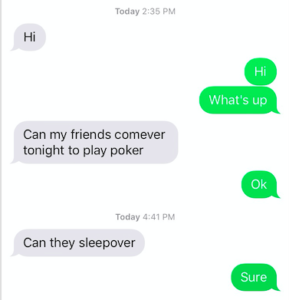 So this text from my son asking if his friends can come over to play poker gave me some much needed brevity. It changed my attitude. The meeting I was rushing to was onboarding for our new hires. As I was walking there, (I had to go from one building to another), pre-text, I was dreading it. My eye hurt, I didn’t feel like talking to anybody let alone strangers, and I was afraid of what they’d think if my eye started watering. But after this text and my good laugh, I felt better. And when I went into the room, as I was talking, I made a joke about my eye. It’s more sensitive in sunlight, and as I addressed someone in front of the window, I felt my eye twittering. I told him I wasn’t winking at him. Someone else replied that they had just gone through the sexual harassment training, and we all got a good laugh out of it. It’s true what they say – laughter really is the best medicine! This text from my son, unbeknownst to him, helped me get through the rest my day and reset my whole attitude. I hope ya’ll had a good Monday, and if not – reach out to someone who can make you laugh!